Happy holidays from all of us at IAC! We'll be back on January 2. All of us at the Immunization Action Coalition (IAC) wish you, our readers, a safe, happy, and relaxing holiday season. Because of the holiday schedule, we will not publish another issue of IAC Express until January 2. The IAC office will be closed on December 24, 25, and 31 as well as January 1. IAC recently reviewed and updated its Ask the Experts: Hepatitis A web page with questions answered by CDC experts. Ask the Experts: Hepatitis A: Revisions include new guidance for post-exposure prophylaxis of hepatitis A exposure and pre-exposure prophylaxis for international travel (including vaccination of infants as young as 6 months of age). Disease burden information was updated and the entire set was reorganized to make location of specific topics simpler and more consistent with other ATE sets. CDC published Influenza Activity—United States, September 30–December 1, 2018 in the December 14 issue of MMWR (pages 1369–1371). A summary is reprinted below. Influenza activity in the United States was low during October 2018, and, although it increased slowly during November, activity remains low across most of the country. During the week ending December 1, 2018, the percentage of outpatient visits for influenza-like illness (ILI) was equal to the national baseline and was at or slightly above the region-specific baseline in four of the 10 U.S. Department of Health and Human Services regions (Regions 4 and 7–9). The majority of jurisdictions experienced minimal or low ILI activity since September 30; however, two experienced moderate ILI activity, and two experienced high ILI activity during the week ending December 1. The percentage of deaths attributed to pneumonia and influenza remains below the epidemic threshold, and the rate of influenza-associated hospitalizations remains low. Five laboratory-confirmed, influenza-associated pediatric deaths occurring since September 30 have been reported to CDC. During the week ending December 1, the majority of jurisdictions (40 states, the District of Columbia, Puerto Rico, and U.S. Virgin Islands) reported sporadic or local geographic spread of influenza activity, nine states reported regional activity, and one state reported widespread activity. CDC published a "Quick Stats" report, Percentage of Adults Aged ≥18 Years Who Had an Influenza Vaccination in the Past 12 Months, by Diagnosed Diabetes Status and Age Group—National Health Interview Survey, 2017 in the December 14 issue of MMWR (page 1374). The text accompanying the "Quick Stats" table is reprinted below. In 2017, among adults aged ≥18 years, those with a diagnosis of diabetes were more likely to have had an influenza vaccination in the past 12 months than those with a diagnosis of prediabetes (62.5% versus 56.1%); those with no diagnosed diabetes were the least likely to have had an influenza vaccination (40.1%). 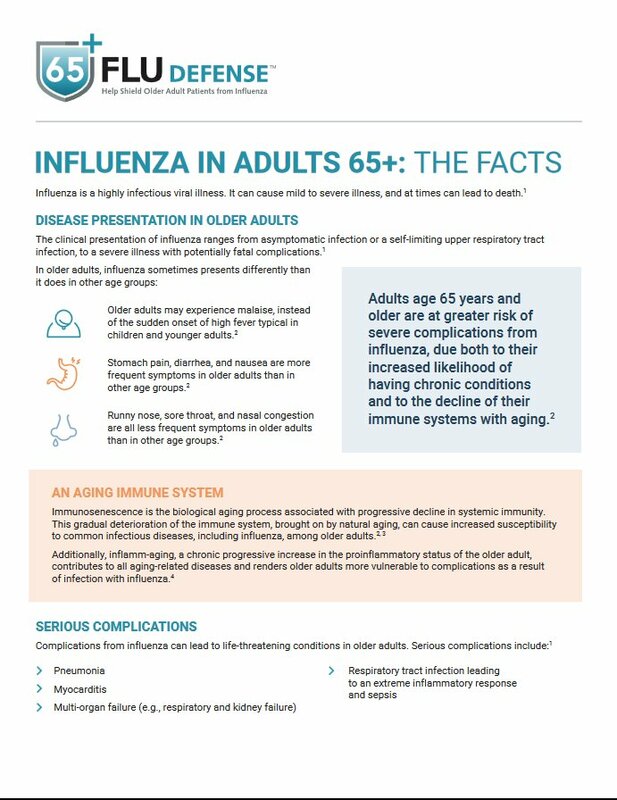 Among adults aged ≥65 years, influenza vaccination was higher for those with a diagnosis of diabetes (74.5%) or prediabetes (73.0%) than for those with no diagnosed diabetes (65.1%). For adults aged 18–64 years, influenza vaccination rates also were highest for those with diagnosed diabetes (54.3%), followed by those with diagnosed prediabetes (48.7%), and were lowest for those with no diagnosed diabetes (35.0%). Regardless of diabetes status, influenza vaccination rates were higher among those aged ≥65 years than among those aged 18–64 years. IAC’s easy-to-read, Q&A handouts for parents and patients are available in English and Spanish. This collection of 20 ready-to-print materials promote vaccination against chickenpox, hepatitis A, hepatitis B, Hib, HPV, influenza, measles-mumps-rubella, meningococcal disease, pneumococcal disease, polio, rotavirus, shingles, and whooping cough-tetanus-diphtheria. They feature simple, friendly illustrations. Specifically developed to be short and non-medical, the handouts emphasize the dangers of the vaccine-preventable diseases listed above and the importance of vaccination. Download these print materials and make copies for parents and adult patients. 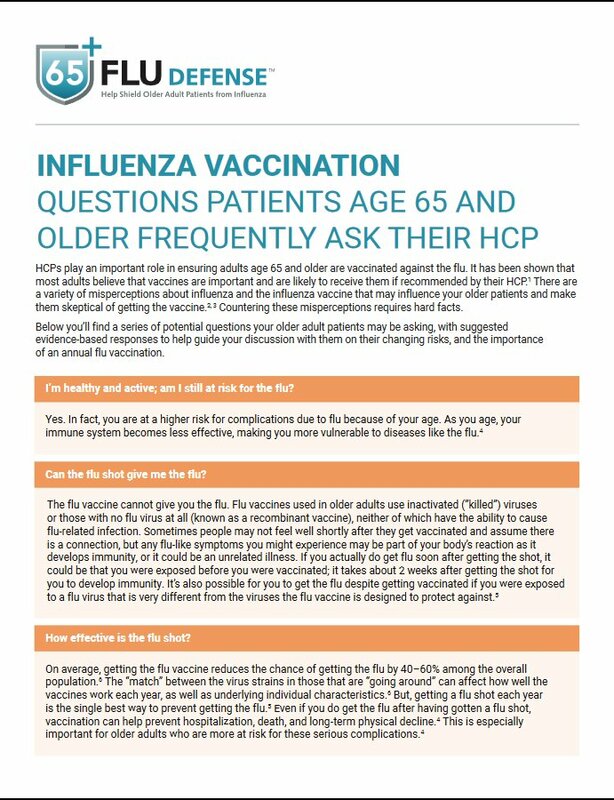 All these handouts—in English and Spanish—can be accessed from IAC's Q&As: Diseases and Vaccines, Easy-to-Read Handouts web page. Scroll down to see all the selections. Voices for Vaccines (VFV) has posted a new Vax Talk podcast for December discussing what you need to know about the flu. In Episode 24, The One About Influenza, L.J Tan, MS, PhD, IAC chief strategy officer, shares his knowledge on influenza past and future, how to improve flu vaccine uptake, and who needs a flu vaccine. Influenza season is now under way. CDC stated in its Weekly U.S. Influenza Surveillance Report, FluView, that as of the week ending December 8, the geographic spread of influenza in three states was reported as widespread; 10 states reported regional activity; 21 states reported local activity; the District of Columbia, Puerto Rico, the U.S. Virgin Islands and 16 states reported sporadic activity; and Guam did not report. One influenza-associated pediatric death was reported to CDC during week 49. This death was associated with an influenza B virus and occurred during week 48 (the week ending December 1, 2018). A total of six influenza-associated pediatric deaths have been reported for the 2018–2019 season. Last season, there was a record-setting number of pediatric deaths in the U.S. (172), so be sure to protect all your patients for whom vaccination is recommended. On December 6, the National Association of County and City Health Officials (NACCHO) released a new podcast in its Podcast from Washington series. In this podcast, Melinda Wharton, MD, director, Immunization Services Division, National Center for Immunization and Respiratory Diseases, Centers for Disease Control and Prevention, spoke with Ian Goldstein about the history of National Influenza Vaccination Week and how important vaccinations are at all stages of life. They also discussed how local health departments can encourage their communities to get vaccinated. Comprised of nearly 3,000 local health departments across the United States, NACCHO is focused on being a leader, partner, catalyst, and voice for change for local health departments around the nation. Circulation published Influenza Vaccine in Heart Failure: Cumulative Number of Vaccinations, Frequency, Timing, and Survival: A Danish Nationwide Cohort Study by Daniel Modin, et al. in its December issue. The abstract is reprinted below. Background: Influenza infection is a serious event for patients with heart failure (HF). Little knowledge exists about the association between influenza vaccination and outcome in patients with HF. This study sought to determine whether influenza vaccination is associated with improved long-term survival in patients with newly diagnosed HF. Methods: We performed a nationwide cohort study including all patients who were >18 years of age and diagnosed with HF in Denmark in the period of January 1, 2003, to June 1, 2015 (n=134048). We collected linked data using nationwide registries. Vaccination status, number, and frequency during follow-up were treated as time-varying covariates in time-dependent Cox regression. Results: Follow-up was 99.8% with a median follow-up time of 3.7 years (interquartile range, 1.7–6.8 years). The vaccination coverage of the study cohort ranged from 16% to 54% during the study period. In unadjusted analysis, receiving ≥1 vaccinations during follow-up was associated with a higher risk of death. After adjustment for inclusion date, comorbidities, medications, household income, and education level, receiving ≥1 vaccinations was associated with an 18% reduced risk of death (all-cause: hazard ratio, 0.82; 95% CI, 0.81-0.84; P<0.001; cardiovascular causes: hazard ratio, 0.82; 95% CI, 0.81-0.84; P<0.001). Annual vaccination, vaccination early in the year (September to October), and greater cumulative number of vaccinations were associated with larger reductions in the risk of death compared with intermittent vaccination. Conclusions: In patients with HF, influenza vaccination was associated with a reduced risk of both all-cause and cardiovascular death after extensive adjustment for confounders. Frequent vaccination and vaccination earlier in the year were associated with larger reductions in the risk of death compared with intermittent and late vaccination. The National Foundation for Infectious Diseases (NFID) is inviting abstracts for its 2019 Annual Conference on Vaccinology Research (ACVR), which will be held April 3–5 in Baltimore, Maryland. The deadline for submitting an abstract is January 10, 2019. Access additional information on the 2019 Annual Conference on Vaccinology Research (ACVR) Call for Abstracts web page. Intramuscular (IM) Injection Sites: In this CDC training video on intramuscular (IM) injection sites, nurse educator JoEllen Wolicki identifies the proper sites for an IM injection for children and adults and lists techniques used to administer a vaccine in the muscle. Images of the vastus lateralis and the deltoid muscles help in identifying the preferred, safe sites for injection.